June 8, 2015 – Hummingbirds, which artist John J. Audubon called “glittering fragments of the rainbow,” are once again darting around flowers and feeders in South Carolina, say state natural resources officials. Hummingbirds are as fascinating to study as they are beautiful to watch. The S.C. Department of Natural Resources (DNR) encourages South Carolina residents to landscape with flowers, hang out a feeder and invite hummingbirds to lunch. In return, they’ll entertain you with their antics and add a little color to your life. Thousands of South Carolina residents enrich their summers by feeding hummingbirds. Male ruby-throated hummingbirds, which feature the characteristic metallic blood-red throat bib, began showing in South Carolina in late March, with their white-throated mates arriving from the tropics about a week later. Most hummingbird activity around feeders, however, does not really pick up until midsummer. Do not despair if you had hummers at your feeder early during the migration period and now there are none. Some of those birds continued flying north and others stayed here but are busy raising young and taking advantage of plentiful natural food sources. 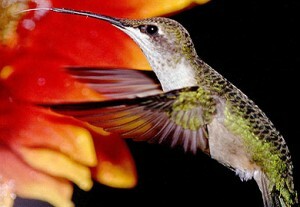 Under natural conditions, hummingbirds obtain sugar by eating the nectar of flowers and the sap of trees. Homeowners can duplicate this part of a hummer’s diet by placing a sugar solution in a hummingbird feeder, with the added attraction of getting to witness the antics of one of nature’s most delightful and colorful birds. Hummingbirds consume 50 percent of their body weight daily in sugar, which makes it one of the most important food items in a hummer’s diet. 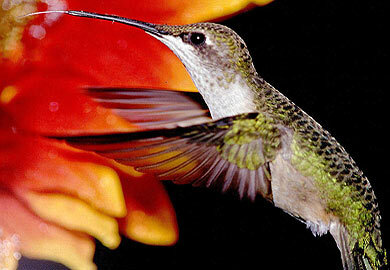 A wide variety of hummingbird feeders are now available on the market. If you have used the feeders in previous seasons, be sure to wash the hummingbird feeder with hot water and vinegar or hot water and bleach to destroy all mildew and mold left over from last year, then rinse thoroughly with clean water. This is the most important thing to do to make these birds’ stay in the Palmetto State more enjoyable. When making the sugar-water mixture, DNR advises boiling the sugar and water solution for about three minutes—this will help retard fermentation. Store all unused solution in the refrigerator, and keep the feeder mold-free by keeping fresh nectar in it at all times. As soon as the solution becomes cloudy, discard it. If you are putting a feeder up for the first time, don’t be discouraged if hummingbirds don’t come right away. It may take a while for them to find it and establish a visitation routine. Be sure to keep the solution fresh especially as the days get warmer, because birds will not be attracted to a fermented solution. Feeders can be left up well into the fall season, and this will not cause the hummers to delay their migration. Migratory birds base their departure date primarily on the changing day length, not on the availability of food. Actually, leaving feeders up into the fall will help the late migrants that stop for a rest on their way back to Mexico and Central America as their natural food sources will be limited at that time.